Mike Tolbert Coming to the Steelers? 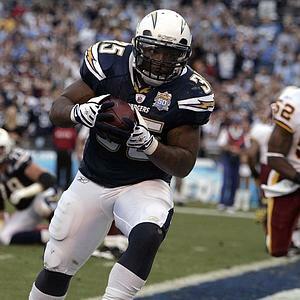 The Steelers may have a new running back coming to town, as with Rashard Mendenhall’s 2012 season clearly up in the air, the team may get San Diego free agent RB Mike Tolbert. Kevin Acee of the SD Tribune reports that the Steelers and Panthers are the two front runners to get Tolbert, a back who last season rushed for 490 yards and 8 TD’s for the Chargers. Tolbert puts up 4.1 yards per carry, and has been in the league for four seasons. His best year came two years back when he ran for 735 yards and 11 scores. He can greatly put Steelers fans at ease about the RB situation. If the Steelers can get Tolbert, it would be a great insurance policy if Mendenhall isn’t ready to start the season. Tolbert met with KC on Thursday, but that won’t happen since they inked former Browns RB Peyton Hills. It seems like the Steelers and Panthers are by far the two best fits for Tolbert’s services. 2 Comments on "Mike Tolbert Coming to the Steelers?" Sign Mike Tolbert and release Rashard Mendenhall.